I have a passion for weightlifting, nutrition, and great-tasting food. My specialty is cooking with protein powder. Ask me a question and I'll turn it into a delicious, protein-filled recipe! Hi Protein Chef! I love banana bread and was wondering if you had a recipe for protein banana bread. My grandma always makes it, and I wish I could do a healthy version of it. Thanks! A freshly made loaf of banana bread is hard to resist. Strong is the person who can walk away from it without pausing to at least consider giving in to temptation and eating a slice ... or three. Eating your grandma's banana bread every once in a while is fine, but eating it on a regular basis? That's probably not a great idea (sorry, Grams). Traditional banana bread is primarily made out of sugar, white flour, and butter. Even though it features a fruit—the almighty banana—banana bread isn't healthy. It's mostly sugar and fat. You can leave it for a cheat day, if you do cheat days. You can enjoy it as a treat when you make those once-per-year trips to Grandma's. Guess which option I've chosen? 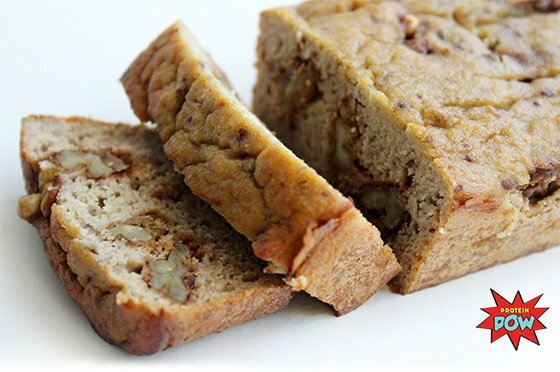 Say hello to this ultra-moist Banana Nut Protein Bread. It's seriously one of the best banana protein breads I've made; and I've made a few. Here's the recipe! To make your bread lower in carbs, you can substitute the banana for some pumpkin or butternut squash puree. 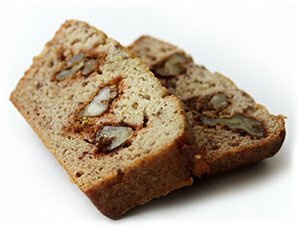 As long as you use banana-flavored whey protein powder, you should end up with tasty banana bread. You can also eliminate the dates but, if you do, I suggest you add in some sweetener to ensure the bread hits all the right notes. If you don't have banana whey protein powder, a vanilla whey protein will work just as well! If you want to use casein, you can. Just use 1/4 extra cup of liquid egg whites (or two whole eggs). Consider adding some seeds to the mix! Flaxseeds or poppy seeds are a delicious addition.